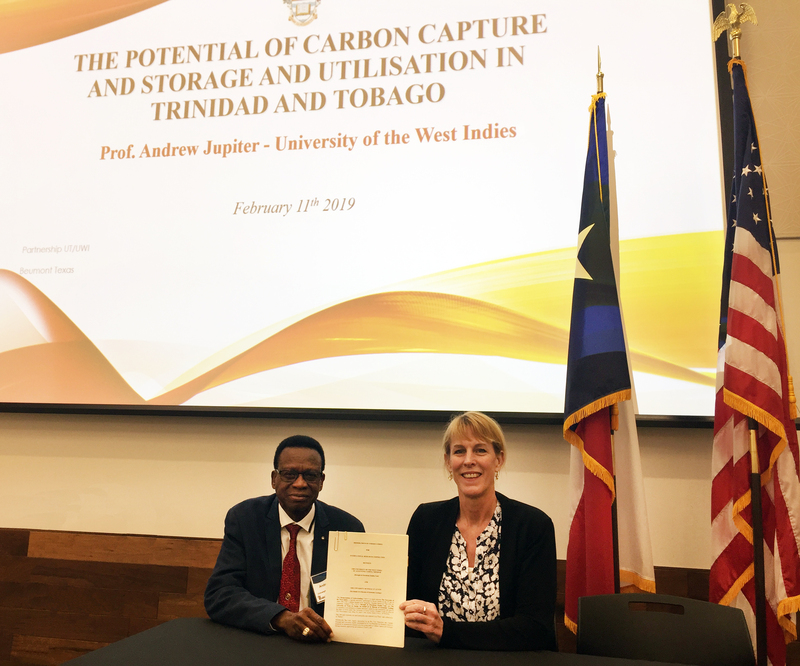 The MOU states that, together, they will cooperate in international research activities in the field of carbon capture and geologic storage (CCS), organize scientific meetings and workshops, and share facilities towards the shared vision of deploying CCS technology in Trinidad and Tobago. The memo was signed by Professor Brian Copeland, Pro Vice Chancellor/Principal of the UWI, St. Augustine and Mark Featherstone, Assistant Director of the Office of Sponsored Projects at UT. Romanak is a research scientist who studies environmental monitoring of geological CO2 storage sites. She is part the Gulf Coast Carbon Center, an experienced research group within UT that has developed and monitored CCS projects for nearly 20 years. The International Energy Agency states that CCS must be upscaled by nearly two orders of magnitude by 2050, 75% of which must come from developing countries. Romanak has worked with developing countries, including Nigeria and Ghana, to help get CCS technology in their country. She is well acquainted with the process of how countries can engage with the UNFCCC Technology Mechanism to obtain the funding to gain the critical skills needed for deployment. Trinidad and Tobago is highly vulnerable to the increasing impacts of climate change in the Caribbean. Located in the middle of a large warm sea affected by the Atlantic hurricane season and with an island size of just less than 2,000 square miles (about the size of the state of Delaware), Trinidad and Tobago is experiencing more severe natural disasters. Although small in absolute global emissions, Trinidad and Tobago has one of the top ten highest greenhouse gas emissions per capita globally. The University of the West Indies and the University of Trinidad and Tobago, two academic institutions in the twin-island republic, are addressing this concern through innovative collaborations with government energy institutions to develop sustainable energy resources that are critical to the economy of the country. Jupiter, former Permanent Secretary of the Ministry of Energy and Energy Industries for Trinidad and Tobago and now the Methanol Holdings Trinidad Limited (MHTL) Chair in Petroleum Engineering and Distinguished Fellow of the University of the West Indies, is ready to lead the way. While sequestering carbon dioxide (CO2) in forests is an attractive mitigation option for a country like Trinidad and Tobago, it and several other climate mitigation technologies are not the country’s best option. Carbon storage in forests or using renewable energy options like solar and wind currently require a large land mass area which the small island nation doesn’t have. During the COP panel Jupiter said that “even if the whole island was trees, no houses, it wouldn’t be enough.” All mitigation options must be explored and CCS is where these partners can add value. The energy professionals have the subsurface engineering experience needed to implement geologic CO2 storage in brine reservoirs. Dr. David Alexander, an Assistant Professor of Petroleum Engineering at the University of Trinidad and Tobago, noted that a simulation using local geological reservoirs showed that the technology’s amount that it would be able to offset was promising for their particular emissions scenario. Alexander has plans to involve his students in a project to amend the oil and gas reservoir simulations to model CO2 injection into brine reservoirs. The strategy to green existing industries to ensure workers aren’t left behind—while focusing on a transition to a low-carbon economy with a variety of fuel sources—is what Brian Kohler of IndustriALL Global Union called a “just transition” during the COP panel. Katherine Romanak, on behalf of the Bureau of Economic Geology at The University of Texas at Austin, is enthusiastic about the start of what she hopes to be a long and fruitful partnership that sets a precedent for what’s possible in an international collaboration on climate change mitigation. Posted in Emily Moskal.Tagged carbon capture and storage, climate change partnership, developing countries, emissions reduction.